Because I’m a stay-at-home mom, most of the time, I have a pretty casual wardrobe. It’s not to say that I won’t wear something made of a fine fabric from time to time, but there’s usually not a lot of opportunities for me to put them on. Consequently, I tend to make a lot of ‘wash & wear’ style garments. So, when I have the opportunity to work with a different material, I jump at it! This time it’s silk chiffon. Yes, I know, most people cringe when they hear those two words, but I was giddy. After week(s) of fiddling with muslins, sewing French seams, and practicing a lot of patience, I can say this particular garment is just about finished – I just have the hems before it’s done! (Whew!) Just in time so I can do a bit more Christmas present sewing! I wonder which project I should tackle first? This entry was posted in General on November 30, 2011 by stacy. It’s almost time for the latest issue of Sew It All magazine to hit the newsstand. If you happen to pick up Vol. 3, you’ll notice a fun little project that I came up for this issue: Head Gear. While the photo on the right shows the basic hat pattern included in the magazine, I also created several looks to change it up including a recycled design, animal, and a faux-hawk for the guys. Best of all, they can be sewn in about an hour – perfect for last minute stocking stuffers! Edited to add: For those interested, this issue will be available on newsstands on December 6, but some online retailers (like The Quilt & Sew Shop) may have it sooner. This entry was posted in General on November 29, 2011 by stacy. You’re probably wondering, what is that a picture of? I’ll tell you. Really, really ugly muslins. I’m sure you’ll agree, muslin making is probably one of the least gratifying types of sewing: there’s no instant gratification because you don’t have a wearable garment, it’s frustrating (especially if you have lots of alterations), and they are generally not very attractive (at least I use ‘old’ fabrics that I won’t intend on using later). However, this time, I had to bite the bullet and make not one, not two, but three muslins before I got the (significant) changes to the pattern and fit ‘just right’. Now I’m ready to whip out my silk chiffon and try my hand at a finished product. I can’t wait – those hot pink zebra stripes were beginning to burn my retinas! This entry was posted in General on November 28, 2011 by stacy. This entry was posted in General on November 25, 2011 by stacy. I think I can safely say, it’s been awhile since I’ve posted this late before! I will also admit, I haven’t done any sewing – instead, I’ve been busy crafting with the kids. One of the projects that took the most time is a Dora fused bead kit that Easton had to have from Michael’s – and how could I resist? Not only was it on clearance (originally priced $19.99, on sale for $5.99), but it’s a rare day that Easton wants to sit down to do a crafty type activity. Even though this was marked for 4+, I highly recommend it: it keeps the kids busy for hours, works on sortingmatching, and is perfect for practicing fine motor skills. Now where can I find some refills? While we were at it, we also picked up some wooden ornaments. Easton was excited about coloring them until he discovered the glitter glue… now all of our ornaments are extremely sparkly, but with very little color. Taylor also brought home some of her pottery that she’s been working on in school. She’s taken art classes before, but none have really made an impact on her until she took ceramics. Now she’s hooked. I just hope she doesn’t ask for a kiln for Christmas next year. This entry was posted in General on November 23, 2011 by stacy. Probably one of the most heavily ‘pinned’ tutorials that I see on Pinterest is the Fat Quarter Gift Bag Tutorial… even my Stocking Swap partner had it (hidden) in hers! So for my final project for this swap, I decided to make one (I figured it was a good way to ‘wrap’ up one of her items and if she chooses to she can ‘recycle it’ this Christmas. The other gift bag I intend on using to stash a teacher gift)! I decided to use a ‘tropical’ Santa print that was accidentally sent by Fabric.com (they told me to keep it and sent the correct fabric) – I wasn’t really sure how I would use this, but once I decided on the gift bag, I knew it might be the right fit. Now that they are sewn up, I realize that the scale of the print might have been too large. While one bag the Santa is pretty prominent, the other one he’s completely ‘lost’ (you can see a hand here and there and a reindeer or two, but that’s it), so the bag just looks ‘tropical.’ I’m guessing that this particular tutorial works best with smaller designs – oh well, live and learn. This entry was posted in Swaps on November 22, 2011 by stacy. I was back at sewing Christmas gifts again this weekend. This time, I made more (you guessed it) box bags. I sewed up the last of the leather bags – fortunately this one went much smoother. I can’t say that I did anything different this time other than use a much heavier leather needle which may have been the solution to all my broken needles all along. The other bag is for my daughter’s ‘Secret Santa’ gift. Since they had a spending limit everyone was told to ‘be creative’ with what they give. So, I made a simple bag and embellished it with a rhinestone, “Gorgeous”, (she said she loved bling) and filled it with her favorite lotion, candy, and a homemade lip balm. Whew! Onto the next project! This entry was posted in General on November 21, 2011 by stacy. One thing I knew I wanted to make my Stocking Swap partner was a purse of some sort. She had some ‘inspiration’ purses in her Pinterest wish list, so I searched all morning and came up empty handed – you would have thought with all the bag books I own, that one design would have looked remotely similar! Instead I decided to come up with something completely different that I think she’ll like: The Charming Handbag from Bend-the-Rules Sewing in a fun skull print! I have a first printing of this book so I should let you know that this particular pattern has some (rather important) information omitted: the sizes for the casing and handles have been omitted from the cutting information (you can find the corrections to the book here). Once I figured out what to cut, the rest of the bag was smooth sailing – in fact I really adore the way it turned out… I think that the skulls bring an unexpected twist to such a feminine shaped purse. I like it so much that I’m considering making one for myself, although I think it really needs some sort of magnetic closure because I’m prone to having things fall out of my purse. This entry was posted in Swaps on November 18, 2011 by stacy. I love handmade Christmas ornaments and these houses are simply adorable. If you’re in the midst of sewing gifts for Christmas and are stuck what you could possibly make for teachers, why not whip up a few of these tea wallets and a few packets bags of holiday blends? Need a new skirt, but are tired of the pencil? Make an easy-to-sew, folded mini. Scrunch bags just have a fun, carefree look about them – learn how to make one for yourself. When we bought our new tv, we discovered we had to use not one, but 3 remotes (cable, sound bar, tv) to sync everything up. I now realize I definitely need one of these remote organizers (I’m also thinking this might make a good Christmas gift for the electronicsgadget fan in your house). Turn a pair of ordinary heals into something fabulous. Perfect for the holidays! Instead of carrying around your skateboard, wear it instead. Simple to create, with adorable results: Monster Mittens. These little love birds will make kids want to use rice heating bags! A Pottery Barn inspired tote – I love all the pockets with this one. 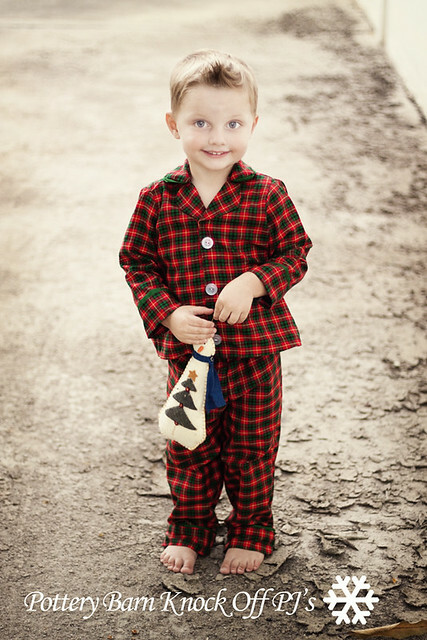 Speaking of Pottery Barn – I adore these Knock-off PJs. You can get the pattern here. This entry was posted in General on November 17, 2011 by stacy. The towel on the left is a fun “Knitty Gritty Quilt Pirate” print (skulls with scissors, I love it! ), the towel in the middle is purchased from Joann’s over Halloween, and the end is the owl print that I’ve used throughout this swap on a multi-colored towel (I was amazed at how the colors matched). It’s been awhile since I’ve done something like this so I’ve forgotten how simple to make and how cute they turn out in the end. I’m thinking that I’ve got enough kitchen towels that are wearing out that I may have to make a few for myself! This entry was posted in Swaps on November 16, 2011 by stacy.